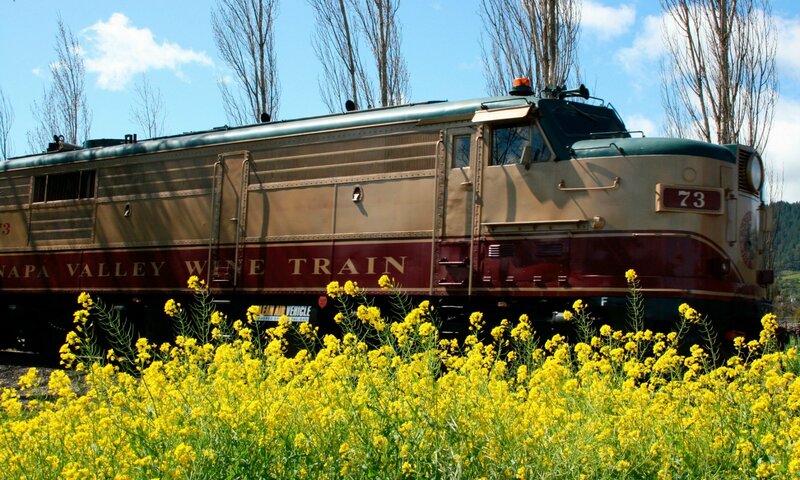 On the Napa Valley Wine Train, we’re always celebrating award-winning wines and the freshest seasonal ingredients, but now that spring is drawing near, it’s time to celebrate something else: mustard season! Each year, beginning in early February, the vineyards of Napa Valley come to life and are carpeted in an eye-catching blanket of bright yellow mustard blooms. It’s the signal of spring and makes for stunning views as the Wine Train makes its way through the valley’s vineyards. Mustard is everywhere this time of year, but that hasn’t always been the case! In fact, it’s not native to California. Rumor has it that missionaries brought it to the state in the 1800s. One story tells of a Jesuit priest with a terrible sense of direction who planted mustard seeds to track his journeys and find his way back to his encampment. Another tells of a Spanish missionary who loved the condiment so much he planted mustard as part of the landscape of each church he established. Regardless of its origins, this vibrant bloom has become a central and essential part of life amid the vines of Napa County. Wine growers use the flower to help control rain flow and irrigate vineyards throughout Napa’s rain season. Not only do the bright flowers and greenery collect rain as it falls, but the plant’s root system also protects against soil erosion. Mustard’s fragrance and spicy taste keep pests away from the vines during an essential part of the growing cycle, too. Then, as mustard season comes to a close and the brightness of its blooms fade, wine growers plow the plants into a natural compost, depositing nutrients into the vineyard’s soil. One thing is for sure; California is extra sunny this time of year, thanks to the bright yellow blooms of mustard in Napa Valley. See it for yourself with a Hotel and Train Package from the Napa Valley Wine Train. Check out some of our favorite photos of Napa in mustard season, taken by guests like you!